Description: This is the 501st escape game specially designed by enagames.com for his beloved fans. 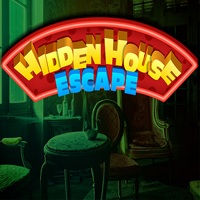 The story of this game is to escape from the hidden house where you have been locked by unknown person. Assume that one day you have seen a hidden house inside dark forest. Once you entered inside the house someone locked the exit door. Try to unlock it by finding four wheels and get escaped soon. Click on the objects to interact with them and solve simple puzzle. Play enagames and have fun!